European Business Award - Inchoo is a National Champion! 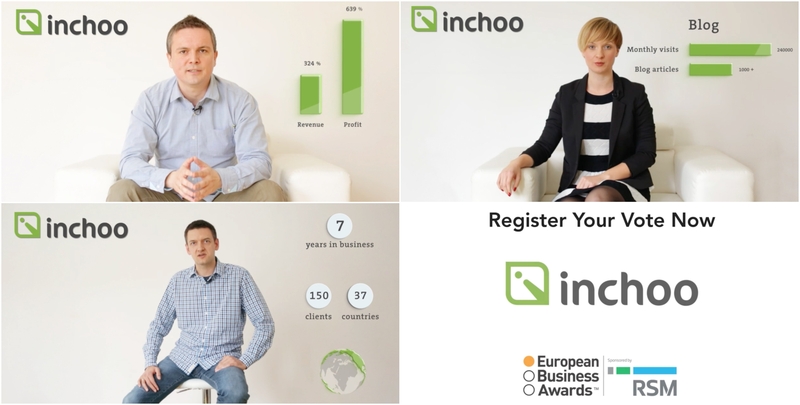 European Business Awards – Inchoo named National Champion! Inchoo has been named a National Champion for Croatia in “The ELITE Award for Growth Strategy of the Year” category, which is a part of the prestigious European Business Awards competition supported by various business leaders, academics, media and political representatives from across Europe. Several months ago we filled in the application for European Business Awards. After some “heavy judging”, we are now entering the final stretch of the competition alongside other successful businesses throughout Europe, competing for new accolades. After we won that “Business Takeoff” award in December of 2014, throughout the period of last 8 months, we’ve continued our growth efforts (let’s just say a recognition can be a wind in the back). Being recognised now as the EBA National Champion means someone recognised those efforts. For us, being a part of that kind of community is a big deal. The old saying “Act locally, think globally” is starting to pay dividends giving the fact that EBA engaged with over 32 000 businesses from 33 European countries for this year’s awards, which mark the 9th year of EBA existence. Out of those 32 000 business, only 678 companies from across Europe have been chosen to go through to the second phase of the competition. In the next round every National Champion is required to make a presentation video, telling its own unique story and explaining their “secret ingredient” to business success. The judges will view all of the National Champions’ videos and award the best of this group the coveted ‘Ruban d’Honneur’ status. All of Ruban d’Honneur recipients will then go on to take part in the grand final in 2016. Separately, the National Champion videos will be made public on the European Business Awards website as part of a two stage public vote, which will decide the “National Public Champions” for each country. We need you as well – public voting is now open! For the public vote part, we are looking to engage the great supportive community of our dear site visitors and blog readers – that means you! You’ve all (special thanks to our employees and clients) been with us throughout the process and helped us grow – which made this award a possibility. Simply click on the picture and you will be taken to the official awards page where you can see us in action and vote for us right there and then! Congratulations! I am sure the award is well-deserved.